A couple of days ago I took my DAM and headed out to a good friend of mine to do some listening tests. My DAM at the moment is powered by a Salas BiB at 12VDC. It has a DIYINHK XMOS based USB to I2S interface powered by a Salas Reflektor-D at 3.3VDC. The same power supply powers the isolated side of the DAM. 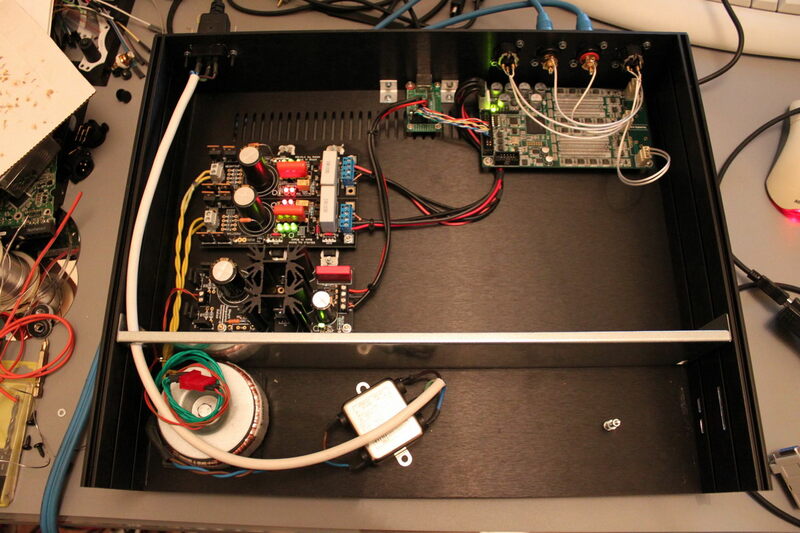 The first objective was to assess the importance of a good DC power supply instead of a plain transformer. In order to do that I took with me an extra 50VA toroidal with 2 x 7V windings. My friend’s system consists of Magnepan speakers, a DIY fet-based preamp and DIY power amp (solid state, 60KG monster). It is widely regarded as a very revealing and non-forgiving system. Any change in any of its components (or a component withing the components) is clearly heard. The DAM was connected to the preamp through its unbuffered outputs. We gave the system some time to warm up (it was probably a couple of hours) and then sat down to listen. We started with the DAM as it was, with the Salas BiB. We then unplugged the Salas and hooked up the plain transformer. The change was immediately obvious. The sound thinned, it became more harsh in the high end. It also lost resolution and detail. Going back to the BiB made all the good qualities come back. Thus, I can definitely recommend a proper DC power supply for the DAM. I cannot say whether it was the Salas that did the work or that any DC power supply would do the same, but the improvement was definitely there. Note that I have the BoM for the Salas BiB I built in the Soekris’ page. The second objective was to assess the difference that could be made by using a “proper” output stage after the unbuffered outputs. So I built a pair of AMB alpha20 line amplifiers. I set their gain to 2 and powered them temporarily by the same Salas BiB that powers the Soekris. Note that my DAM outputs roughly 1V RMS at its output @ 0db since I’m using a filter that includes attenuation at FIR2 (I can’t really remember which one it is though..). This meant that the alpha20 brought its output to a nice 2V RMS. Going back and forth between using the alpha20 and just the unbuffered outputs, the conclusion was that the alpha20 removed a small amount of the “magic” of the DAM while not really helping in anything besides output volume. I was hoping that it would help improve the dynamics of the DAM – its Achilles’ heel IMHO. In my friend’s system the DAM sounds “flat” compared to his other sources (a heavily modified Sony 50ES cdp, a Buffalo 3 DAC, and an Aune S16). However, this “flatness” is not particularly obvious in other more forgiving systems. So, my assessment of the DAM so far is as such: It has great detail, exceptional mid-range, proper bass, it is a little soft on the highs, but its main problem is the dynamics. It can sound a bit “flat”, with this “quality” either accentuated or minimized, depending on the rest on the system. If there was a way to improve its dynamics, to make it more “aggressive”, it would be a stellar performer (with a proper DC power supply of course). As is, it is just great VFM. 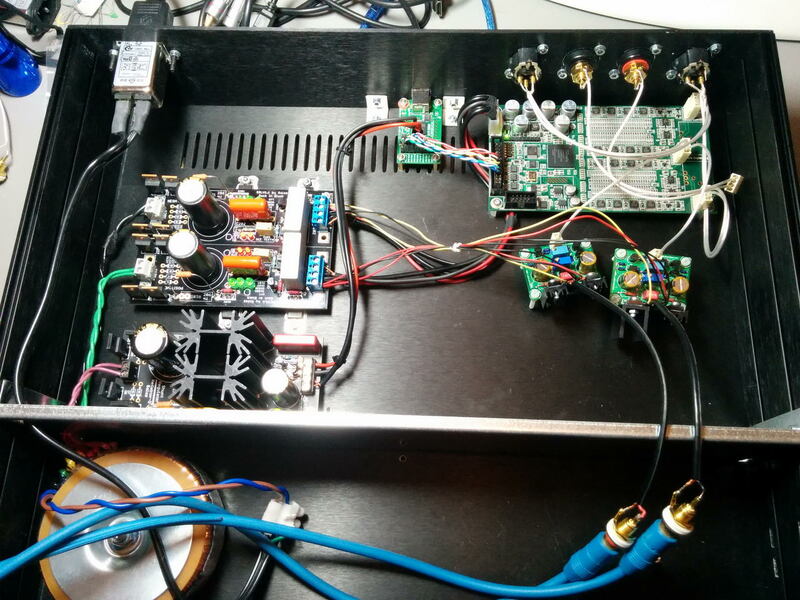 This entry was posted in DIY Audio and tagged alpha20, DAC, DAM1021, R2R, Salas, Soekris by Dimdim. Bookmark the permalink. what transformer would you recommend for your Salas BiB Setup (VA, Secondaries)? I’m using a 2 x 14V 100VA toroidal, but I have a total of 6 secondary windings (for various / other purposes). You should be just fine with a 50VA unit. 14VAC means that the BiB is getting about 18VDC, giving a pretty safe 6V margin for the shunt reg to work with. Interesting…have you tried a tube-stage like an aikido ? I ended up as well with a BIIi with Broskie’s tube i/v-unbalancer and it is unbelieveable dynamic and colorful. All the guys questioning the Sabre should first try that. without it…like in many commercial applications….forget it. I’m afraid that I have no experience with tube stages. Their high THD puts me off.. Perhaps I should try one out.. But the idea of reading up on tubes is a little daunting for me these days. I already have too many projects going on.. But I ‘ll try to find some time to check out this aikido stage that you mentioned. Its a weekendjob, just get a kit from broskie, glassware…its a piece of cake to build…and if you do not need more volume, even a simple tubebuffer, whichhe as well offers, might be a good alternative. it will give a much more dynamic and love-athmosphere and clarity…that was the effect on the sabre dac.